2018 was the year of rapid escalation in the technology world. It's 2019 and there is no slow down as well. It was only a raising journey with never-ending progress, which brings us to the most awaited software trends to watch out for in 2019. Every year new minds in the company come with new ideas and plan that play a significant role in the growth and development of the company. The innovative ideas and knowledge lead to the rapid technological advancement that evolves the custom software development. For the success and growth of the company, it is essential for the software development companies to stay updated according to the latest trends and technology. The software development companies nowadays are more focussed towards improving the experiences at multiple levels including the customer experiences. The changes and updates in the custom software development and incorporation of the latest trends help the businesses to run smoothly. Here we have enlisted the latest trends that the custom software development company should opt for defining their growth. The growth of Open Source Technology: Earlier the businesses do not rely on open source technologies, but nowadays big companies like Google and Facebook utilizes open source software solution to run their businesses. Apart from these, the other leading software technologies like JAVA, PHP, Angular, React, Hadoop are open source and power some of the world's biggest enterprises. So if your business work is dependent on technologies, then opting open source technology should be your top priority. Artificial Intelligence Ready Software: AI is already a main platform of the digital platform today. This has made the technology as a need rather than a choice. Technology plays a crucial role in getting better results on every front. Most of the enterprises have already adopted Artificial Intelligence to automate the business processes in a cost-effective manner while many are approaching for partnering with custom software development companies to develop technology-driven frameworks for the execution of more tasks every day. The integration of AI technology helps in enhancing the value of the businesses and help in driving the customer's experience digitally. Updated Cloud Technology: Cloud computing is the delivery of on-demand computing services -- from applications to storage and processing power. Today maximum businesses run on this technology. The increasing demand for cloud technology has transformed in many ways. Some of the latest cloud services include the blockchain, virtual reality, or even IOT. These services prove to be highly beneficial for developers and businesses. The technology has been incorporated with other unrelated fields in an industry like distribution of resources, identity management, smart contacts, supply chain management, healthcare data and lots more. With cloud computing technology businesses are able to work freely from anywhere, thus it will help businesses increase their ROI on technology investments. Cybersecurity On Top Priority: With every technological advancement, there is a growing need for maintaining cybersecurity. The rise of cloud computing opens the new cans of worms for developers which increased the breaching rate in many different countries. For the successful update of technology, it is essential for the companies considering the security aspects as well. 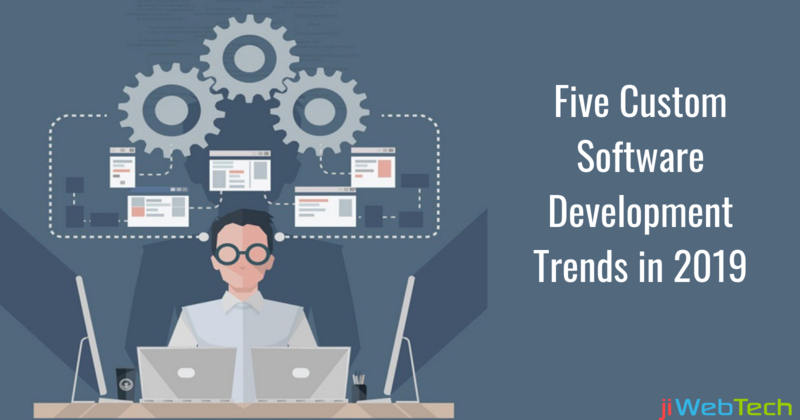 There are many latest trends and updates in the software development solutions to consider and prioritize the need for maintaining cybersecurity. Nowadays the developer's duty is now not only limited towards creating great codes but also to practice secure coding standards that help in enhancing safety and ensuring the security of customer data. 5G Proliferation: 4G technology will soon be overtaken by 5G by the end of this year. With this person will be able to download files with a blink of an eye. Top-end 4G networks like 4G+, LTE-A or 4.5 G have a download speed of 300Mbit/s while the 5G commits to offer the download speed of 1000Mbit/s. This will enhance user experience and help in accelerating the development of the Internet of Things, virtual and augmented reality mobile apps, self-driving cars, drone delivery and a lot more. If you’re interested in custom software development and need a technology partner, have a look at our services at jiwebTech to see if we might be the right fit for your next project.